Andrew became a follower of the Lord Jesus Christ, aged 12, by God’s grace and through the faithful and relentless proclamation of the gospel, by the many that God put in his path at the start of high school. He is married to Liz and they have four children; Finn, Jaimee, Evie, Tilly. He enjoys discovering new music, loves meals with friends (old and new) and watching or playing sport. Andrew serves the St Andrew’s church family as Senior Minister. Before starting at St Andrew’s in 2013 Andrew and his family spent 7 years at Christ Church Fulwood in Sheffield, England. He is thankful for all he learnt there from the church family and those he served alongside in discipleship, church planting, evangelism and preaching. 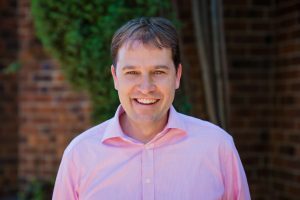 Andrew grew up not far from Wahroonga and is passionate about sharing the wonderful news of our Lord and Saviour, Jesus Christ, with this part of Sydney. He would love to welcome you to St Andrew’s at any of our Sunday gathering.